An experiment between nature and technology, this cyborg hanging garden allows plants and artificial lights to co­exist and co­evolve based on people's movements. 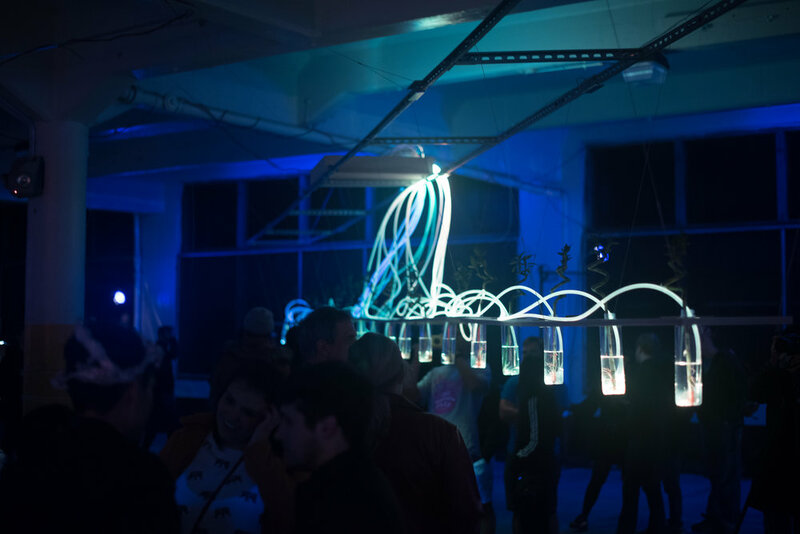 As visitors approach the installation, the light spectrum changes to enrich the energy provided to the plants' roots and to enliven the garage’s dark space. The installation makes viewers aware of the diversity of light we encounter in life: the lack of light, homogenous light in interior spaces, and over­lighted spaces. Zenovia Toloudi is an architect, artist, and Assistant Professor at Dartmouth College. She has received a Doctor of Design degree from Harvard, a Master of Architecture from Illinois Institute of Technology (as a Fulbright Fellow), and a Diploma in Architectural Engineering from Aristotle University of Thessaloniki. Her work has been exhibited internationally, including Venice Biennale, The Lab at Harvard, and Athens Byzantine Museum.